GrahamsGut.com — Diary of a mans attempt to lose his gut. Here’s an article from the NHS on the 5:2 diet. Basically it says there’s no evidence the 5:2 diet works and there are potential health risks. The 5:2 diet is an increasingly popular diet plan with a flurry of newspaper articles and books being published on it in the run up to Christmas 2012 and in January 2013. The diet first reached the mainstream via a BBC Horizon documentary called Eat, Fast and Live Longer, broadcast in August 2012. The 5:2 diet is based on a principle known as intermittent fasting (IF) – where you eat normally at certain times and then fast during other times. The 5:2 diet is relatively straightforward – you eat normally five days a week, and fast on the other two days. What does a daily 600-calorie diet look like? A 600 calorie diet could consist of a slice of ham and two scrambled eggs for breakfast and then some grilled fish and vegetable for your evening meal. And of course nothing but water, black coffee and /or green tea to drink. However we could not find (admittedly using a non-systematic approach – see below for more details) any peer-reviewed evidence that the 5:2 diet can bring these benefits, and only a very limited evidence base for IF in general. Despite its increasing popularity, there is a great deal of uncertainty about IF with significant gaps in the evidence. how sustainable is IF in the long-term – would most people be willing to stick with the plan for the rest of their lives? Are there any side-effects from intermittent fasting? However, more research would be needed to confirm these side-effects and their severity. If you are fasting, you may want to think about how fasting will impact on your life during your fasting days. You are likely to be very hungry and have less energy and this could affect your ability to function (such as at work), in particular it may affect your ability to exercise which is an important part of maintaining a healthy weight. Also, IF may not be suitable for pregnant women and people with specific health conditions, such as diabetes, or a history of eating disorders. Because it is a fairly radical approach to weight loss, if you are considering trying IF for yourself, it is wise to speak to your GP first to see if it is safe to do so. There does not appear to be any research evidence that looks directly at the 5:2 diet. There is some degree of evidence about the potential benefits of other forms of IF – albeit with some significant limitations. It should be stressed that our assessment of the evidence was confined to entering a number of keywords into Google Scholar and then looking at a small number of studies which we felt would be useful to explore further. We did not carry out a systematic review (though arguably, it would be useful for researchers to do so). So the information provided below should be taken in the spirit of us trying to provide an introduction to some of the evidence and science of IF – not an exhaustive ‘last word’ on the topic. Is there any evidence that intermittent fasting aids weight-loss? One of the most recent pieces of research on intermittent fasting is a 2012 study (PDF, 291.4Kb) which recruited 30 obese women known to have pre-existing risk factors for heart disease. After an initial two week period they were then given a combination diet of low calorie liquid meals for six days of a week (similar to Slim Fast diet products) and then asked to fast for one day a week (comsuming no more than 120 calories). After eight weeks, on average, the women lost around 4kg (8.8lb) in weight and around 6cm (2.3 inches) off their waist circumference. These women may have had increased motivation to stick with the diet because they knew their weight would be monitored (this is a psychological effect that slimming clubs make use of). The women had been told that they were at risk of heart disease. It is uncertain how well most of us would cope with such as extreme diet. The follow-up period was short – just two months. It is not clear whether this diet would be sustainable in the long-term or whether it could cause any side effects. 30 people is quite a small sample size. A much larger sample – including men – is required to see if intermittent fasting would be effective in most overweight or obese people. Is there any evidence intermittent fasting increases life-span? There is quite a wide range of work on the effects of IF on combating the effects of aging, but almost all of these studies involved either rats, mice or monkeys. One big problem with studies in animals – particularly rodents – is that they are only expected to live for a few years, this makes them ideal subjects for longevity studies. However, to carry out similar, more useful experiments in humans, requires decades-long research to gain credible results. In an unsystematic look at the evidence, we find only one study involving humans: a 2006 review (PDF, 64.7Kb) of an experiment actually carried out in 1957 in Spain. In this 1957 study, 120 residents of an old people’s home were split into two groups (it is unclear from the study whether this was done at random). The first group (the control group) ate a normal diet. The second group (the IF group) ate a normal diet one day and then a restricted diet (estimated to be around 900 calories) the next. After three years there were 13 deaths in the control group and only six deaths in the IF group. This study is again limited by the small sample size meaning that the differences in death are more likely to be the results of a statistical fluke. Also, many experts would feel uneasy about issuing dietary guidelines based on a study over half a century old with unclear methods. It is unlikely that this experiment could be repeated today – denying food to elderly people in residential care is unlikely to be looked at kindly by an ethics committee. Is there any evidence intermittent fasting prevents cognitive decline? It seems that all of the studies on the supposed protective effects of IF against conditions that can cause a decline in cognitive function (such as dementia or Alzheimer’s disease) involve animals. For example, a 2006 study (PDF, 843.1Kb) involved mice that had been genetically engineered to develop changes in brain tissue similar to those seen in people with Alzheimer’s disease. Mice on an IF diet appeared to experience a slower rate of cognitive decline than mice on a normal diet (cognitive function was assessed using a water maze test). While the results of these animals tests are certainly intriguing,animal studies have inherent limitations. We can never be sure that the results will be applicable in humans. Is there any evidence intermittent fasting prevent diseases? Much of the published research into the potential preventative effects of IF involve measuring biological markers associated with chronic disease, such as insulin-like growth factor-I (IGF-I) – known to be associated with cancer. Using these kinds of biological surrogates is a legitimate way to carry out research, but they do not guarantee successful real-world outcomes. For example, some medications that were found to lower blood-pressure readings taken in laboratory conditions failed to prevent strokes once they had been introduced for use in the healthcare of patients in the world. A 2007 clinical review (PDF, 118.6Kb) looking at the effects of IF in humans in terms of ‘real-world’ health outcomes concluded that IF (specifically, alternative day fasting) may have a protective effect against heart disease, type 2 diabetes and cancer. However, it concluded ‘more research is required to establish definitively the consequences of ADF (alternative day fasting)’. Here’s a useful article about some pretty poor diets that some people may be considering in the new year. It goes without saying that you should not even think about doing any of these. You may lose weight in the short term but at a massive cost to your health and as soon as you stop, you’ll put it all back on again. What’s the point? Most of us hope just to get through the holiday season without adding too many extra pounds. But once January 1st hits, many will make a resolution to lose weight before summer bikini season. Nutritionists have long told dieters not to fall for any of the empty promises of fat diets, yet some still try them in hopes of quick weight loss that they will later sustain with better eating habits. Unfortunately, that almost never happens. It is estimated that 50 million Americans go on a diet each year, but only about 5% manage to keep the weight off. At any one time, more than 66% of Americans are actively trying to lose weight or maintain their current weight. This book, authored by British writer Venice Fulton (a pseudonym for Paul Kannah), first suggests that one exercise first thing in the morning after drinking only black coffee. Exercising on an empty stomach has had some positive research on its ability to burn fat faster, but most experts suggest that a small snack may help you sustain the exercise session longer (you may not fatigue as easily), so in the end it is what you are most comfortable with. Fulton also suggests continuing to fast up to three hours after exercise to continue the fat burn. This is not supported by nutritional science, which suggests eating within one hour after exercising encourages optimal recovery so that you can exercise regularly. There is also some studies that support morning exercise as being the time least likely to be interrupted by other tasks, so people may stick with the program longer. Again, most fitness experts will say to find the time to exercise when is best for your individual schedule. The key being – just get out there! While this component of the OMG diet isn’t too controversial, some of his other guidelines most certainly are. For example, to rev up your metabolism, Fulton suggests taking an ice bath every morning. While it is true that our bodies need to increase the amount of energy it uses to warm the body back to normal temperature, this effect does not last long, and likely does not make any difference in overall weight loss. Mr. Fulton also is on the no-carb-whatsoever bandwagon. Even fruit is off-limits because the body “does not know the difference between chocolate cake and an apple.” While studies continue to go back and forth about reducing the amount of overall carbs currently recommended in the daily diet for optimal health, most experts would agree that chocolate cake is not the same as an apple, nutritionally speaking. A healthful diet consists of a variety of foods, such as whole grains, lean protein, fresh fruits and vegetables, beans and nuts/seeds. It is believed that there are several top models and other red carpet celebrities are fans of this very dangerous diet where you literally starve yourself during the day, saving the calories for alcohol later in the evening. In the US, individuals most likely to follow this type of eating pattern are college-age females who are bulimic and who binge drink. Victoria Osborne, assistant professor of social work and public health at the University of Missouri who explored the practice of drunkorexia, has said, “depriving the brain of adequate nutrition and consuming large amounts of alcohol can be dangerous.” Both behaviors can lead to “short- and long-term cognitive problems” as well as an increased risk for alcohol poisoning and death. In clinical nutrition, parenteral nutrition (PN or TPN for total parenteral nutrition) is when a patient is fed through an intravenous drip because of their inability to eat normally. It is reserved for critical cases to prevent malnutrition when a patient cannot effectively use his or her gastrointestinal tract. There are potential complications, including an increased risk of infection. So why would anyone willingly follow a plan that suggests eating nearly nothing all day and then going to a clinic for an IV nutrition drip? Apparently several celebrities have jumped on board with this quick weight loss “secret” in the days to weeks preceding an “important” event, so they can fit into a certain dress or pant size. 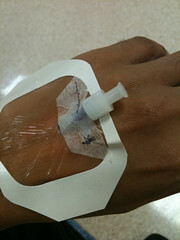 An IV drip, much like a nutritional supplement, does not supply the body with every nutrient it needs to be healthy. While you may lose a quick 15 pounds, there is no health advantage to be gained by following this fad diet. Again, certain “routes” of feeding patients clinically should not be options for healthy individuals. In addition to the IV drip diet above, some clinics will also offer enteral nutrition feedings, another option given to critically ill patients who cannot eat adequate amounts in the normal fashion. Again, a dieter will eat nearly nothing for ten days (24 hours a day with only one hour off for bathing and dressing) while sporting a backpack filled with a liquid formula that is pumped into the body via a tube entering through the nose and ultimately ending in the stomach. This tube feeding is essentially a low calorie liquid diet, but without having to drink the formula orally. Although around for several years in France, the Dukan Diet was introduced to the world by the bride of Prince William, Kate Middleton. She and her mother, Carol Middleton, were reportedly following this extreme diet in preparation for the Royal Wedding. The complex, four-cycle diet was created by French physician Pierre Dukan. Each cycle, beginning with a “no-carb, protein only” phase, restricts a certain food category which is said to lead to greater fat burning. As with most diets, there is little solid evidence that this will lead to sustained, successful weight loss. In addition, the Dukan diet is so confusing, time-consuming, and rigid that for most of us, it is very hard to sustain for any real length of time. Even Dr. Dukan himself warns of lack of fatigue, constipation, and bad breath (due to ketogenesis). Why are celebrity weight loss stories so compelling? Obviously part of it is the same reason why people read about celebrities in general. But there is an added factor with the weight loss story: the hope that you will learn about some new way to revolutionise your own weight loss. We know celebrities shape our attitudes towards body image but they also affect the way we think about losing weight. And not in a good way. Here are five myths that celebrity weight loss stories promote, that undermine our own weight loss. Myth 1: The Quicker the Weight Loss the Better. Every day I see a new celebrity weight loss story about how quickly a celebrity has “bounced back” from pregnancy weight to a swimsuit body. And if you’re Jessica Simpson, you get the pressure for not having bounced back quick enough. But it’s not just post-pregnancy where there is an obsession with speed of weight loss. Most celebrity weight loss stories dramatise fast weight loss as being more impressive. “Eating rabbit food” is often associated with the celebrity weight loss regime. But overhauling your normal diet with lettuce or any other form of deprivation is not a good plan for most people, because let’s face it, who wants to deprive themselves for the rest of their life? When you go back to eating what you used to eat, you’ll gain the weight back. The better approach is to make small, gradual changes to your regular diet. Tied in with getting quick results, is the “no pain, no gain” approach. You’re not doing enough to lose weight unless you’ve really taken it to the extreme. Lady Gaga captured this attitude with her controversial tweet a few months ago: “#Popstarsdonteat”. Most people think that weight loss requires a superhuman effort with drastic changes to what you’ve been doing. And that involves sacrificing fun and enjoyment. Well it’s not true. In fact, if you are going to continue your new changes for the long-term, you need to be able to have fun (eat out and travel amongst other things) to make sure you stick with it. Most celebrities heavily emphasise exercise as a big factor for their weight loss. But especially for women, if you rely on exercise alone to lose weight, you will be sorely disappointed. For women, limiting your calorie intake (eating less) is much more important than exercise (exercise is of course still good for you). To put it another way, these celebrities who lose weight may have punishing exercise regimes but they are also not eating cheeseburgers on their days off. And if they were, then it’s doubtful that exercise could ever compensate. But the most important point is that you don’t need to go to extreme lengths to exercise. Especially if you are relatively inactive, it’s best to start very slowly and then build up. The sad thing I often see, is people who get put off from doing any exercise, because they think it’s either got to be painfully intense or not worth doing it at all. Celebrity weight loss stories often leave us with the impression that there’s no point trying to lose weight unless you get to the end-goal of looking like a supermodel? But did you know that if you’re overweight, even cutting back your weight by 5% can have a positive effect on your health? If you need to lose a large amount of weight, forget the eventual goal for now. Just focus on a small goal that you know you can achieve. Even a small amount of weight loss can make a difference to how you feel. You have to let these small victories nourish you as you head to the bigger goal. Be patient and persistent. Celebrities Don’t Help with Weight Loss. Celebrities are nice to look at, and they provide many of us with entertainment (and something to write about) but please don’t get your weight loss advice from them. Finding the time (or the inclination) to exercise can be a big stumbling block for many people when it comes to getting, and staying, in shape. I used to be as guilty as anyone for not managing to find time to exercise but the solution to it was as simple as it was effective. In the past when I used to start some exercise regime, I would go from doing nothing at all, to trying to do an hour a day. I’d see results pretty quickly but I’d soon get bored and start to miss days here and there, and before I knew it I was doing nothing at all again. But in 2011 when I decided to finally get in shape, I turned that idea on it’s head and instead of jumping in the deep end with a heavy exercise regime, I started doing just a few minutes a day. Seriously, only three or four minutes a day of light exercise. I had no excuses not to do it because everyone can spare a few minutes. I also didn’t feel the need to procrastinate or find excuses not to do it because it wasn’t difficult and didn’t take much time. What it did do though was allow my brain to develop the HABIT of doing exercise. So I didn’t have to force myself to do it, it became something I ‘just did’ everyday. And every day I did just a little bit more. Not enough to put me off, but just a little bit. And eighteen months later I now do around an hour of exercise a day, but it’s just as easy for me as when I was doing a few minutes a day. I took it slow, I gave my body and my mind time to adapt, and now I’m as fit as a fiddle and looking good. So my advice… don’t jump in at the deep end. Chances are, you’ll quit within a few weeks. Start slow, very slow and give yourself a year or two to get into it. After all, you didn’t get fat in three months, what makes you think you can (or should!) get back in shape in three months?